Splice Closures is done to join fiber optic cables either to extend the lengths or to repair damages. After fibers are spliced, they will be placed in a splice tray which is then placed in an splice closure. Outside plant closures will be carefully sealed to prevent moisture damage to the splices. The closure will be placed in a designated protected place to complete the installation. All cables that contain metallic elements like armor or strength members must be grounded and bonded at each splice point. Closures are designed to clamp cable strength members to provide strength to prevent pulling the cable out and seals to prevent moisture damage to the splices. The splice closures are available as in-line or dome. 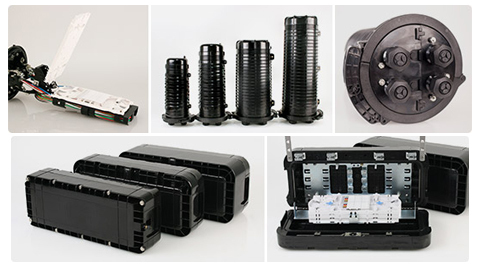 These closures can be used for splicing of upto 192 loose buffer tube fibers. The accessories include sealing grommets, hander hardware and splice trays. The splice closures are of compact design, easy to install and re-enter. They are rugged, water-proof, and UV-resistant.